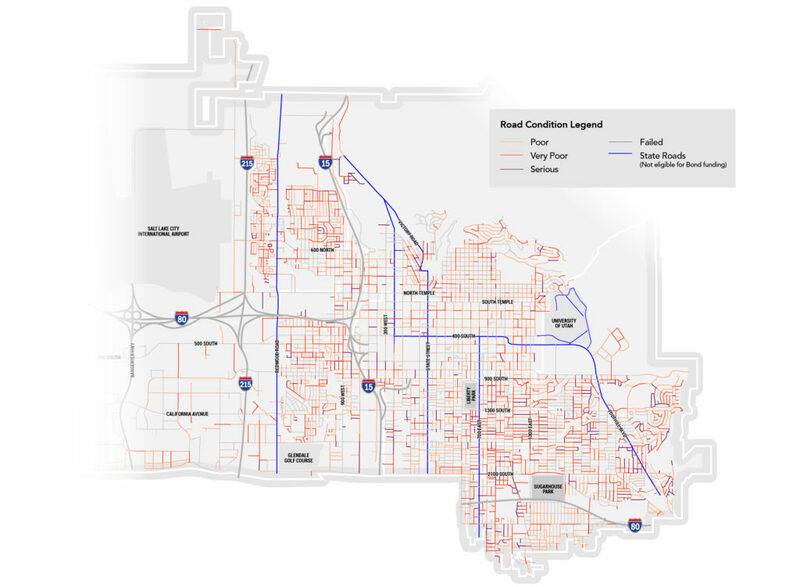 A 2017 pavement condition survey revealed that nearly two-thirds of Salt Lake City streets are in poor or worse condition. A large number of these streets are in such poor condition that they need to be entirely rebuilt. Click on the pavement condition map to view the status of the streets you use every day. Part of the May 2017 approved sales tax increase boosted funding for ongoing street maintenance (resurfacing, pothole repair, etc. ), but funding for capital-intensive streets reconstruction projects was still needed. To fund some of these significant road-construction needs, City leaders asked voters to approve an $87 million General Obligation (GO) bond in November. Voters approved the bond 67.51%. City leaders propose using results from a recent comprehensive engineering study to apply funds in an 80/20 split – meaning 80 percent of funding would go to the major streets residents use most and 20 percent would be spent on local neighborhood streets. The first streets reconstruction projects funded by the bond is expected to begin design in 2019 and construction in 2020. View the Mayor’s press release following the November 2017 vote. Because the City is paying off two existing bonds in 2019 for the Main Library and The Leonardo, a GO bond would have minimal new financial impact on property owners. Property taxes for the average home would increase slightly – less than $5 a year. Bond revenue can only be used for specific one-time projects. When the ballot says the bond is for street reconstruction, the City may only use that money for street reconstruction. A GO bond is the City’s preferred revenue option because it provides the accountability that residents have demanded. Bonding is a financially-responsible approach for the City and is the least expensive form of government financing.The cost of debt is low – ranging from 3.2% to 5%. Salt Lake City has a AAA bond rating (the highest available) meaning the City has a strong history of managing debt responsibly. The City will use the voter approved bond funds to reconstruct the City’s deteriorating streets. Street reconstruction projects will be selected using results from a 2017 engineering study that identified the current condition of all City-owned streets. The goal will be to address the City’s worst streets first. Based on the recommendation from the City Council, bond funds will be applied in an 80/20 split with 80 percent of funding going to major, high-use streets that require more money to reconstruct and 20 percent going to local, neighborhood streets, which typically require less money to rebuild. Allocating funds this way will ensure that all areas of the City receive funding. Salt Lake City’s Engineering Division will use the following criteria to determine which streets reconstruction projects can be completed within the required time frame that will maximize the use of funds and minimize disruption to residents. Use the link below to report a pothole or other street condition issue.